Popcorn is a small Windows application which sits nicely in the Windows tray, tracking what you're listening to and giving you one-click access to a couple of online services. With Popcorn, you're able to select which media player to monitor (VLC Media Player, Winamp or Media Player Classic). From the system tray, you can search YouTube or Vimeo videos. You can also post what you're watching or listen to to your Facebook page. Version 0.1.0.4 is a freeware program which does not have restrictions and it's free so it doesn't cost anything. 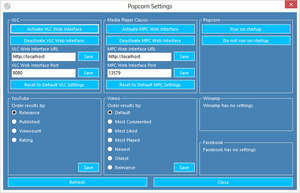 For security reasons, you should also check out the Popcorn download at LO4D.com which includes virus and malware tests. Additional screenshots of this application download may be available, too.